In my salad days as vulgarity correspondent”that is to say, a reporter on the disgusting ways in which young British people so often chose to behave”I was sent one year to the Glastonbury Festival. This is a large gathering of the British lumpenintelligentsia come to celebrate its own appalling taste in music, in a place vaguely associated with druidism, the healing chakras of the earth, Hopi ear candles, and that kind of thing: ideal, in other words, for people who claim to be spiritual but not religious. The weather that year was terrible, with torrential rain that turned the fields in which the festival was held into a veritable sea of mud. I still have the Wellington boots that I bought, and needed, for the occasion. The rain turned out to be an enormous blessing: For insofar as it ruined the festival, it improved very slightly the average level of civilized behavior in the world and reduced noise pollution. I had noticed before that rain improves the behavior of young British people: It discourages them from leaving their homes. Rain is also the best, almost the only, prophylaxis nowadays in Britain against crime. Every afternoon for many years I walked between the hospital and the prison, in both of which great institutions I worked. In fine weather, seven or eight parked cars en route would have been broken into, the shards of their smashed windows sparkling prettily in the gutter as the sun caught their facets. But in the rain, not a single car was ever broken into. From this I naturally concluded that the fundamental cause of crime in Britain was sunshine. The statistics were unarguable. This year, unhappily, the weather at the Glastonbury Festival was fine, so that the lumpenintelligentsia was able to disport itself exactly as it wished. The crowd”I hesitate only slightly to call it the mob”was addressed by the man who might be Britain’s next prime minister, Jeremy Corbyn, whom it greeted like a rock star, which should have been enough to give any decent or sensible man pause. Among the worst of Mr. Corbyn’s vices, however, is his sincerity. 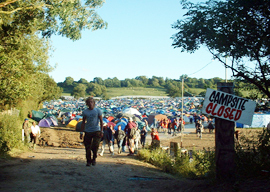 He enthused the massed ranks of youthful idealists by telling them that another world was possible: As indeed it was, for when they departed Glastonbury, they left behind them so much litter in this corner of rural England that it made a rubbish dump in Mexico City seem like Switzerland. I don”t think I have ever seen so much detritus left behind by a crowd of people anywhere in the world. What was most intriguing to me was the fact that the crowd must have been contentedly wallowing in this rubbish for days on end, for it could hardly have accumulated in the last hour or two of the festival. Horrified no doubt by CO2 emissions and rising temperatures, they failed to notice what was about their very feet, and certainly did nothing about it. Indeed, they slept contentedly among it, too exhausted by their idealism and labors of licentiousness for them to apply their minds to anything as lowly as the litter that they dropped, as cows defecate in fields. It was for others to pick up their rubbish after them: That is what social justice required. After a little reflection on this subject, I came to the conclusion that the most powerful intellectual influences on contemporary British youth are (appropriately enough) two women, one of them fictional and the other historical. Meanwhile, her own children around her fall down the stairs, get their heads stuck between railings, and go hungry, all in conditions of the utmost dirt and disorder.